Rock slide and 40ft obstacle course rental | AboutToBounce.com New Orleans LA Keywords: PRODUCT NAME, new orleans bounce house rental, new orleans water slide rental, new orleans party rental, mechanical bull rental, inflatable rentals, jump house rentals, interactive games, obstacle courses, rock climbing walls, gyroscope, bouncer rentals, party rentals in the New Orleans area. 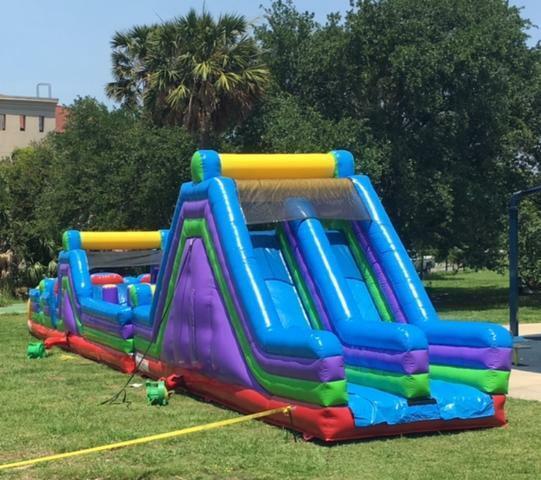 Desciption: Bounce House & Water Slide Rental from Abouttobounce.com; Your best choice in New Orleans and the surrounding areas for quality party equipment rentals. Providing water slide rentals, mechanical bull rentals, tents, rock climbing walls, interactive games, moonwalks and exciting party rental equipment. This About to bounce 40 foot obstacle corse and a 17ft. rock wall slide with 2 lanes.